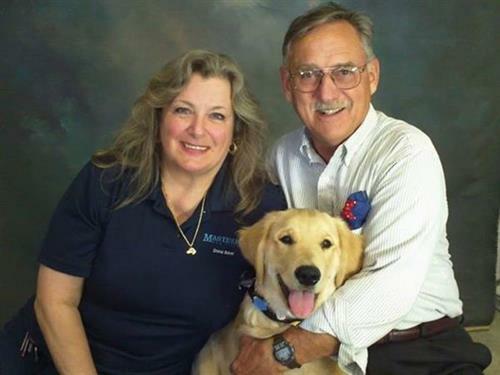 Masterful Dog Training, Inc. is New Bern's premier dog training company. With decades of experience training dogs and teaching people, Dona Baker has established herself as eastern North Carolina's go-to person for all dog training needs. You can teach an old dog new tricks. We do it all the time with adopted dogs and dogs that never had training but need it now. From Puppy Kindergarten to Advanced Obedience to Fast & Fit Fidos Agility, we've got it all covered at MDT. We can teach you how to train your dog to do just about anything but you need to know how to do it. That's why our motto is "Teaching For Both Ends of the Leash". Dona Baker is the go-to person for problem-solving for your dog. Canine Good Citizen training and testing is available at MDT. We have medical equipment on hand for those who want to go further with their training and have their dogs do therapy work. Many of our graduates volunteer at hospitals, nursing homes and for Wounded Warriors bringing joy to folks in need of a smile. Off-Leash Control is a beautiful thing. Imagine being able to let your dog be free and be able to get the dog back! Private and group sessions are available. Private sessions can be in your home or office or you can come to MDT. Our group classes are held at Lynaire Kennels in James City. Agility is the No. 1 dog sport in the country and you can try it out with us. We have agility classes two days per week. Your dog will LOVE it! Call us at 252-672-K9ED (5933) for details. Training can be in your home, office or at our facility.